Walking can be a solo journey, but finding a walking companion or club can keep it interesting and keep you motivated. On days when it is cold, rainy, windy, hot, muggy or days when it is hard to make yourself go out the door, having a companion who you can't let down makes a big difference. Finding the right companion and the right kind of companionship is the key. We'll go through each type with tips and tools on how to find walking friends. What you want: Somebody to walk with on a regular basis. Motivates you to walk by being accountable to another person. Can set a joint schedule and goals. Recruit spouse, family member, or a present friend. This is a very good option. It assures that you already have something in common with the companion. Talking and walking can enhance the existing relationship, spending more time with someone you already care about. 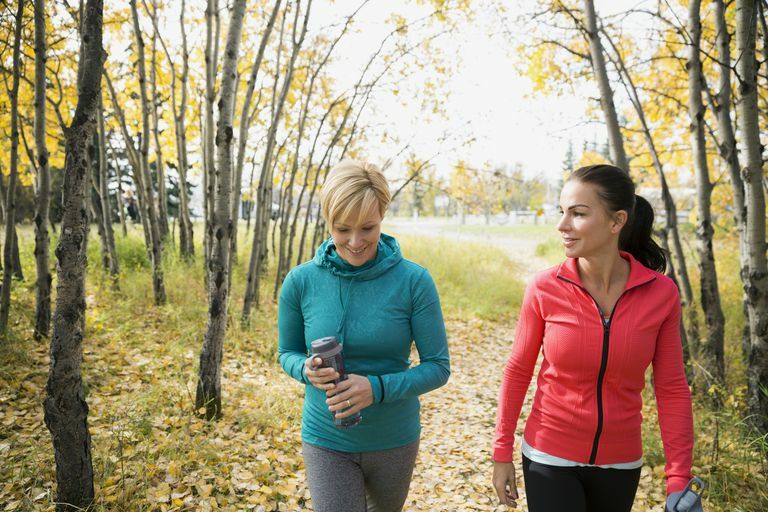 Join a walking club or mall walkers to find potential partners. If your family and friends are resistant to walking, go to where people are ALREADY walking to find your partner. Recruit a partner online. Look for local Facebook or MeetUp.com groups for walking. What you want: A club where you can meet a variety of walkers, who have some structured walking schedules, events, coaching or programs. Interesting walking routes and events. A wider range of advice, idea sharing and coaching. Reward systems for achieving walking goals. IVV Volkssport walking clubs: Non-competitive walkers who participate in 6-mile walks on a regular basis are organized in many countries around the world. Racewalking clubs: These are clubs whose members train for speed and use legal racewalk technique. Walking clubs: Learn how to find walking clubs and organizations in your area. Walking Clubs — International Other walking clubs and organizations in Europe, Asia, and Africa. Mall walking clubs: These clubs are organized individually, so call or visit your local mall to see if they have an organized program for walking. These clubs will generally concentrate on walking indoors for exercise. Running Clubs: Many running clubs also accept walkers as members, and some have a large contingent of walkers and many events organized for either runners or walkers. You Can check the Road Runners Club of America Club List. Medical centers and HMOs are good places to contact to find local walking clubs, as many sponsor walking groups. Check your local running shoe stores for brochures and publications which list walking and running clubs. Health clubs may sponsor walking and running groups, and be sure to check their bulletin boards for brochures or announcements. Participate in a local charity walking event and ask others where to find walking clubs. You can also form your own club. What you want: Group walks or walking events so you can walk with other people. Able to meet other walkers. Planned route, explore new places. Awards — medals or other reward systems. Can vary your level of interaction with others — talk if you want or not. I have found it very easy to start conversations with others as we meet up along the route during a walking event. Walk Finder: How to find charity walks, walks by state, walker-friendly marathons and half marathons, and routes to enjoy. Check your local running shoe stores for brochures and publications which list walking and running events. Check with local walking clubs for upcoming events and group walks. Community calendars list upcoming charity walking events. What you want: Someone to share a walking trip with, for a day or longer. One of the big benefits of walking clubs in Europe is that they arrange for bus or vanpool to walking events. Share expenses — gas, park entry fees, parking fees. Have a driver AND a navigator, someone to get lost with. Share hotel expenses on walking trips and tours, save the single supplement. Camaraderie, shared achievement and someone to talk to on the way. Join a walking club and recruit traveling or carpool companions. On walking tours, ask the tour company to match you with other individual travelers so you can save the single supplement. What you want: To chat with other walkers about walking. Share experiences, triumphs, ask questions, encourage each other. Good back-up when you can't find live walking companions. More likely to locate an expert or experienced walker to give you advice. Online tutorials, coaching, encouragement available 24 hours a day, 7 days a week. Facebook About Walking: A popular group. Meetup.com: Find walking groups in your area. Walklist Email Group: This group of hundreds of walkers worldwide trades messages about walking, especially volkssport event walking. Racewalk Email Group: Hundreds of racewalkers trade email messages each day — everyone from Olympic competitors and coaches to beginners. Great place for advice on walking from experts.